Creamy and cool and perfect for summer! Fire and Ice Salad often contains some sort of pepper (cayenne or jalapeno) to create fiery heat, and then combined that with super-crisp and thoroughly chilled cucumbers, tomatoes, and onions, to create a super-refreshing salad that both teases and cools the palate. I decided to take that concept, mix it up with the concept of a cucumber raita (a yoghurt and cucumber condiment/salad used to cool the palate in between hot curries) and make it my own! 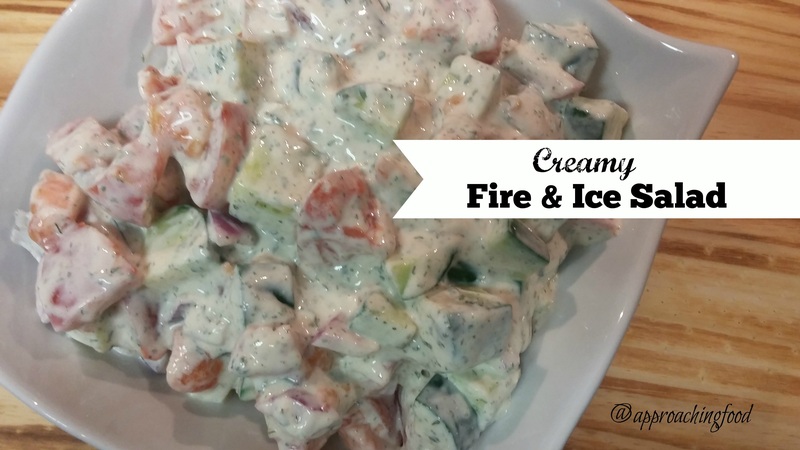 Hence, I present…CREAMY Fire and Ice Salad! I make my own preservative-free ranch dressing mix, and I used that as a base for the dressing, mixing it with sour cream, yoghurt, mayo, and a dash of lemon juice, for a refreshing salad that makes the perfect accompaniment to any summer meal. This can easily be thrown together in 5 minutes, and then set in the fridge to chill until the rest of the dinner is ready. If you don’t want to make your own ranch dressing mix, you can definitely replace it with a store-bought package. You do you, boo! A deliciously cool and creamy salad, perfect to serve alongside BBQ during the summer months! Mix sour cream, lemon juice, mayo, yoghurt, and dressing mix together. Toss with chopped tomatoes, cucumbers, and red onion. I mentioned my veggies for the week in the title to this post. I tend to buy whatever is on sale and whatever looks especially good. I just finished my weekly shop, so this week’s veggies are sweet potatoes, cabbage, cucumbers, tomatoes, fresh spinach, and sweet peppers. I’m making Sweet Potato and Hummus soup, garnished with avocado and sour cream; Coleslaw, using my mum’s recipe (oil and vinegar based); Spinach Salad (IF the strawberries that I’m growing on my balcony ripen in time); and of course, today’s recipe, CREAMY Fire and Ice Salad. Given that I’m cooking for two but using family-sized recipes, I’ll have lots of delicious and nutrient-filled veggie dishes for the week! Next Post: Probably something veggie-filled. Although I’m also craving some fruit. Watermelon smoothies, anyone? Linking Up at Meal Plan Monday, Clever Chicks Blog Hop, and Happiness is Homemade! This entry was posted in Salads I Have Known and Loved on June 4, 2018 by Margaret. I gave this one a try and it was delicious. My husband used storebought ranch dressing but I was happy with just a pinch of salt. We microwaved pita pockets with shredded Colby jack cheese inside and quickly added the cold salad. I did not add the hot pepper but might try it next time, if I can work up the courage. It was awesome. I’m going to try your homemade ranch dressing – I’ll let you know when I’ve had the chance to make some up! May I ask when the baby is due? I see on Prudent Homemaker that your sister has booked the party room – I hope it is a lovely day. A friend of mine just became a first time grandmother yesterday – it’s a girl – so she is thrilled! You’ll love the homemade ranch dressing! I bought some of the dried ingredients from Bulk Barn (they often have a $3 off $10 coupon online), like the powdered buttermilk. I have a trip to Bulk Barn on the schedule for next week so I’ll pick up the bits & pieces needed then – and yes, I’ll keep my eyes open for their flyer to get the $3 off! Hope it’s not too hot this summer for you. October 29th would be the best delivery date possible. It is my birthday.